Will Leggett, School of Government and Society, University of Birmingham, discusses his article, ‘The politics of behaviour change: Nudge, neoliberalism and the state’. I also explore the complex and paradoxical politics of the behaviour change agenda. Thaler and Sunstein presented their project as a new ‘libertarian paternalism’. It is paternalistic, because nudgers are attempting to promote the best interests of ‘nudgees’ (eg to lose weight). But it is also libertarian in the sense that there is no compulsion, and the individual always ultimately has the option to choose differently/opt-out if they wish. Unsurprisingly, having set itself up as a new libertarian-paternalism, criticisms of Nudging have poured in from both these of these traditions. Paternalists (typically on the statist left) see in Nudge the ideological retreat of state action and responsibility for public goods. Conversely, libertarians (from both left and right) see Nudge as a sinister state incursion into our very brains and decision-making. This ambiguity is reflected in the party political take up of Nudge. Behavioural economic ideas were first encouraged in the UK by New Labour, and might be seen as a classic instance of the ‘nanny statism’ they were often accused of. And yet the behaviour change agenda has been even more enthusiastically co-opted by David Cameron and his anti-statist inner circle. ‘The politics of behaviour change: Nudge, neoliberalism and the state’ is part of the Policy & Politics January 14 issue (volume 42, number 1) and is available on Ingenta. 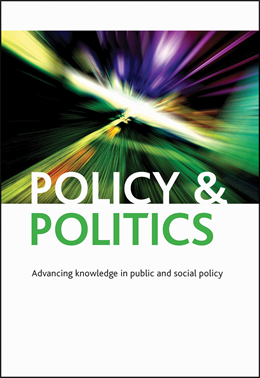 The January 2014 issue of Policy & Politics is now available in print and online. In this issue our authors consider nudge, multiculturalism, ethnic residential stability, lobbying, policy translation, human rights bodies, security regulation, and procurement. We take in policy issues including water and alcohol, and include conceptual debates around neo-liberalism and legitimation. The edition has an international flavour, with perspectives taking in the UK, Turkey, Ireland, and Vietnam, as well as considering ideas around issues of policy transfer between states. We have articles that are both empirically based and more theoretical contributions. Will Leggett’s article critiques nudge by drawing on literature including Foucault and other sociological perspectives on state-citizen relations. He suggests ‘a more explicitly political, social-democratic model of the behaviour change state’ is needed. Hannah Lewis and Gary Craig analyse the idea of multiculturalism by contrasting local initiatives and central discourses in the UK on the issue. In a related piece Katherine Farley and Tim Blackman consider ethnic residential segregation in England. They argue that, despite the political rhetoric around the ‘problem’ of segregation, there is scant evidence at neighbourhood level to support such a stance. Ben Hawkins and Chris Holden analyse the relationships between the alcohol industry and policy makers using qualitative research data. They seek to show how industry actors access and influence policy-makers. The way that ideas spread is discussed by Farhad Mukhtarov. Using the water industry, he moves on the policy transfer literature by introducing the notion of policy translation, and applies it to a case in Turkey. Sarah Spencer and Colin Harvey consider the performance of human rights and equality bodies in the UK and Ireland. By means of comparative analysis, they seek to explain the gap between expectations around and performance of these bodies. Sangeeta Khorana, William Kerr and Nishikant Mishra offer a study on Vietnam’s participation in the World Trade Organization’s Government Procurement Agreement. They suggest an inverse relationship between the costs and benefits of institutional reform to support liberalisation. This issue is available on Ingenta. Look out for blog pieces on selected articles in the issue in the coming weeks.